Medlantis.org, in partnership with global experts in MR safety from The Association for Radiologic & Imaging Nursing (ARIN) and the Society for MR Radiographers & Technologists (SMRT), delivered the first of three talks on MRI Safety. 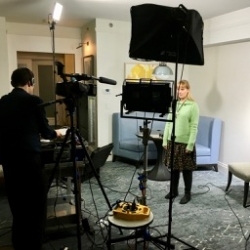 The course was produced and live­streamed by Medlantis.org to viewers in the US, Canada, the UK, and Australia and had attendance 300% higher than anticipated. Toronto, Canada, February 09, 2018 --(PR.com)-- On January 24th, 2018, Medlantis.org, in partnership with global experts in MR safety from The Association for Radiologic & Imaging Nursing (ARIN) and the Society for MR Radiographers & Technologists (SMRT), delivered the first of three talks on MRI Safety. The talk was delivered by Vera Kimbrell, BS, R.T. (R)(MR), FSMRT, who currently leads MR Applications and Training at Brigham and Women’s Hospital in Boston, MA., is a former SMRT President (2013­-2014), and is the current Chair of the SMRT Safety Committee.